Joining me for these conversations are Crossover Chronicles senior writer Joe Manganiello — who also contributes to Bloguin’s culture site, The AP Party — and brand-new CC writer Collin O’Connor, who will join us later in the week. In his prime, Shaquille O’Neal was a Siberian Tiger standing on its hind legs, tossing around helpless defenders and scoring at insane clips. Yet, O’Neal won the MVP award just once in 19 seasons, and he never won a rebounding title. The Big Aristotle was never the defensive force he could have been: he amassed 5.0 defensive win shares twice; Kareem Abdul-Jabbar — often cited as a minus on that end — accomplished it eight times. It’s sheepish to suggest a 4-time NBA champion lacked drive, but as Phil Jackson once wrote, O’Neal could and should have been the MVP for 10 consecutive seasons. Is it sacrilegious to suggest O’Neal left some marks of dominance on the board? Taking Olajuwon over O’Neal, meanwhile, boils down to the former’s defensive edge. Both guys made constant fools of isolated defenders with signature moves (O’Neal drop-step, Olajuwon Dream Shake) that should be illegal, but Olajuwon finished fourth all-time in defensive win shares, and invented the 3,000-2,000 blocks-steals club. That and additional longevity (44,222 minutes played) land Olajuwon on my Mt. 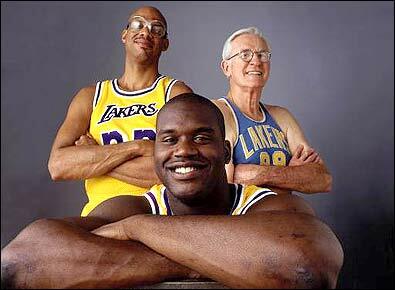 Rushmore of NBA centers. The most underrated player in NBA history? Kareem was the greatest college basketball player of all-time. He won six NBA MVPs (more than Jordan — fair or not) and five championships. He was named NBA Finals MVP fourteen years apart (!!! ), in 1971 and 1985. He has the greatest signature shot ever, started 80 games on a title team at age 40 (in 1988), and led the NBA in blocks four times. Oh, and Magic never won without Kareem. Why Russell over Wilt? Psychology. There’s no reason why Russell owned Chamberlain in the playoffs, but he did. Russell figured Chamberlain out — he knew when to let Wilt score to build false confidence, he knew he could grab a rebound over him whenever he needed to. Yes, Russell had the benefit of playing with better players in aggregate, but basketball is a funny game: months and months of team building and games usually come back to who has the best player. 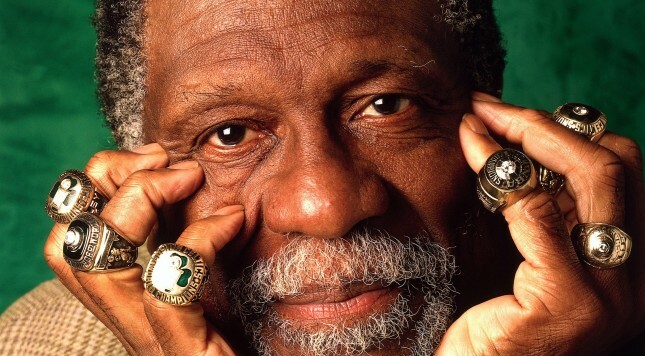 The Boston Celtics didn’t have the most talented player of the era, but in Russell they certainly had the best — 11 rings don’t lie. In terms of both statistics and longevity, Hakeem Olajuwon deserves to occupy this slot. However, how does one not acknowledge a pioneer in his field? That’s what Mikan will always be. Mikan was the NBA’s first great center for the Minneapolis Lakers, a team that created the NBA’s first true dynasty, preceding the Boston Celtics’ even greater run under Red Auerbach and a player who will be discussed below. Mikan also redefined and revolutionized the game. He was responsible for the creation of the goaltending rule, and his dominance also led to the widening of the lane, so that big men would have to circulate through a larger area of the court. Kareem Abdul-Jabbar (top left), George Mikan (top right), and Shaquille O’Neal (middle) — all great Lakers, all great centers. 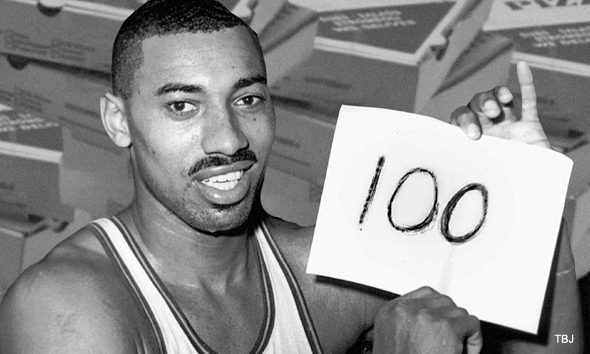 Wilt Chamberlain was as well, but he’s not in this picture. The Lakers really were and are giants in multiple senses of the term. The NBA community was consumed by the “Shaq or sidekick?” question in the 2000s. Debate raged about the extent to which Shaq’s, Kobe Bryant’s, and Dwyane Wade’s legacies were affected by the fact that Shaq wasn’t winning these titles alone. Yet, what was always underrated in those discussions was the reality that Shaq DID win titles as a teammate to two of the best shooting guards of all time. He made his career matter as much as it should have. Constant relevance at the top of his profession for a long period of time. Production on a scale we will not see again. Centrality in two of the best big-men battles in NBA history, against Russell and Kareem. Wilt’s place on this list will remain secure. The lasting testament to Kareem’s greatness as a competitor came in the 1985 NBA Finals. The Lakers, having lost to the Boston Celtics in the previous year’s Finals, were wiped out in Game 1, dubbed “The Memorial Day Massacre.” The Lakers faced a moment of truth as a franchise. Kareem, in Game 2, posted 30 points, 17 boards, 8 assists, and 3 blocks in a victory. A week later, the Lakers beat the Celtics in a playoff series for the first time. Kareem’s completeness as a player was never more evident — or powerful — than in that series. Was it easier to win NBA titles in the 1960s? Sure. Would Bill Russell stack up to Wilt or Kareem solely through the prism of statistics? No. Should it matter? Reasonable people can and will disagree, but the fact that Russell so consistently found his way to the victory podium — especially in direct combat with Wilt — makes him the embodiment of a team player, a man committed to team results without regard for his own numbers. Yet, Russell obviously wasn’t a role player. He worked in concert with teammates even while being an elite performer, especially at the defensive end of the floor. He didn’t just block shots; he blocked them to teammates instead of swatting them out of bounds. He didn’t make statements with his blocks; he started fast breaks and created points with them. That’s the player Russell was. His 1969 NBA title, with an aging core of Celtics against the prime-period Lakers, propels him to the top of this list.